Join designer Laura Rillera for an interactive workshop that will take attendees through their own UX evaluation, using design tools to collect, sort and prioritize both personal and professional goals. 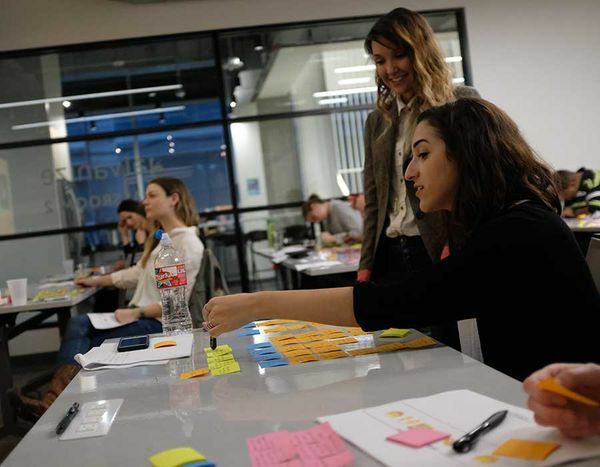 “Design Your Best Self” is an interactive workshop that applies UX design tools, like affinity diagramming, to guide attendees through their own personal UX evaluation. This workshop is inspired by an argomade article that Designer Laura (Lala) Rillera published in 2017, which unpacks her motivations for creating this framework in the first place see here. Essentially, she set out to achieve clarity in her life by collecting, sorting, and prioritizing her personal and professional goals. She identified six basic steps to this process: 1) ideation, 2) organization, 3) planning, 4) tracking, 5) measurement/visualization, and 6) evaluation/adjustment. Sticky notes in 3 distinct colors, a whiteboard or blank sheet of paper to organize them, and a Sharpie pen is all that’s needed to get started. Sometimes it's the simplest of actions that are a catalyst in making the decision for change. After taking herself through the exercise and experiencing its benefits firsthand, she knew she wanted to share with others who are open to and interested in approaching self improvement through the lens of design. A workbook for tracking progress. Laura (Lala) Rillera is a UX and Interaction Designer at argodesign, an Austin-based product design firm. She has worked on software solutions for clients ranging from Dell, Caesar’s Palace, John Deere, Pizza Hut, Lowes, Tag Heuer, Booz Allen Hamilton, and Will.I.Am. She also designed the Webby nominated Disney Movies Anywhere app that shot to #1 in both the Apple and Android app stores. Prior to her work at argodesign, she was an Interaction Designer for Chaotic Moon Studios and also ran her own UI and UX design shop.